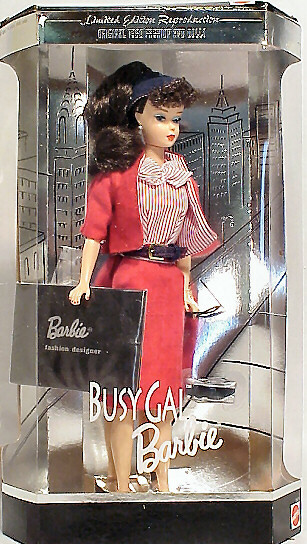 Mattel issued the Busy Gal Vintage Barbie Reproduction in 1995. It features a Brunette Ponytail Barbie with curly bangs , blue eyes and pearl stud earrings. She is wearing a reproduction of the 1960 Vintage Barbie ensemble Busy Gal #981 . Her ensemble includes a Short Sleeve Red Linen Jacket with a matching Sheath Skirt and Red & White Stripe Body Blouse with Bow. She is also wearing a Navy Hat, Belt and Open Toe Heels and has her Black Glasses and Black Portfolio with Sketches. This is one of the harder reproduction dolls to find. Leave Busy Gal Vintage Barbie Reproduction, Return to Vintage Barbie Reproduction Dolls.